The icons in Automation Studio have been modified, to make them easier to interpret. The design now also conforms better to the overall user experience within Marketing Cloud. Activities previously found under the Interactions tab of the Email application, are now exclusively in Automation Studio. You can manage, create and modify File Transfer, Import, SQL Query, Filter and SSJS from here. When you are building an Automation, you can save it without the Starting Source. This can be determined later when you are ready to start running the Automation. It is also possible to change the starting source of an existing Automation. To add a Starting Source to a saved Automation, drag it onto the canvas and click ‘configure’ to set up a Scheduled or File trigger. To change a Starting Source, remove the existing one and drag in the new one. With this release, users can perform a SQL Query in Automation Studio to retrieve Journey Builder data. 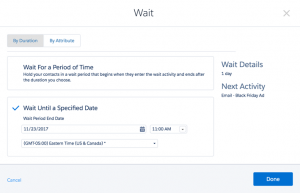 ‘Wait by Duration’ configures a wait for all contacts entering the activity to end at the same time. Example: the wait ends for all contacts on November 23, 2017, at which point you send an ad for a Black Friday campaign. ‘Wait by Attribute’, lets you select a date-based attribute which stores a different date for when a contact will end the wait. 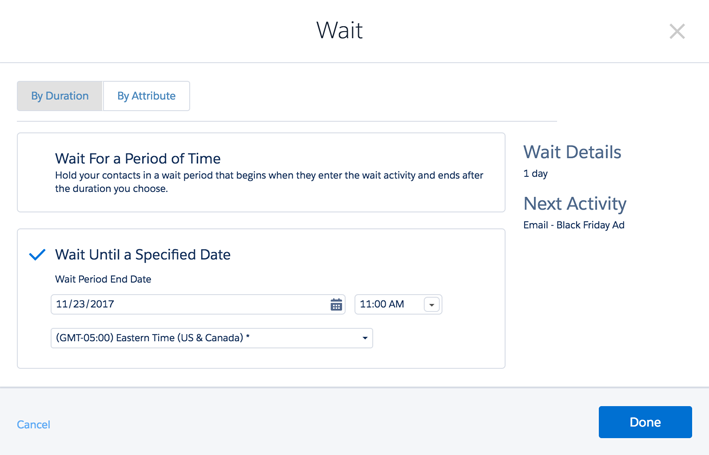 Example: the wait ends 7 days before a subscription end date. 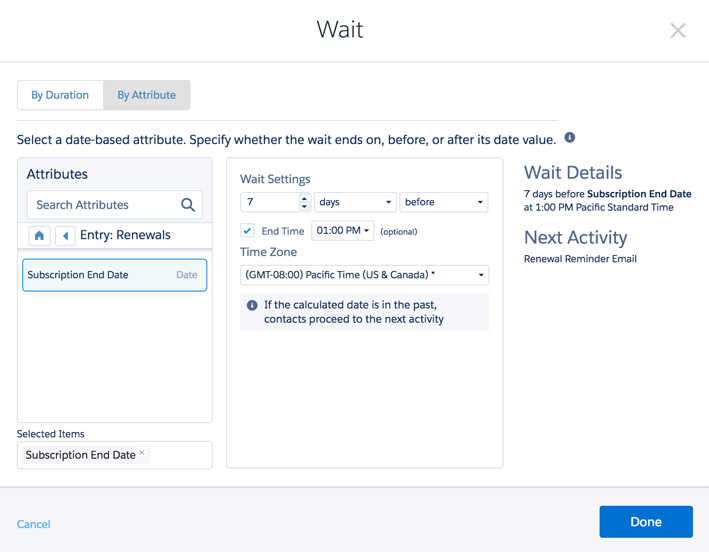 More information about these and other new features in the Salesforce Marketing Cloud August 2017 release can be found on the Salesforce website.